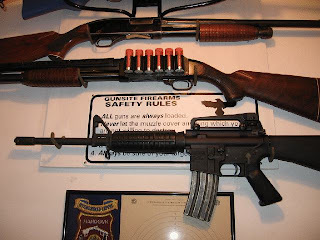 Proper storage of a home defense weapon is a hot topic of debate among some gunners. Often overlooked is the fact that successful defense is most often the result of software, not hardware. In other words, it's what is in the defender's head that matters, often more than what is in his hands......Or in another room of his home. I am a home owner who subscribes to a couple of theories. First, a handgun is a tool to get me to a more effective weapon. Two, an unloaded gun ain't worth squat. Thus, I keep several shotguns in my home. A shotgun is always ready and close at hand. I prefer the Mossberg 500 and Winchester 1300. Because of the multiple guns and the need for them to operate in exactly the same fashion in a crisis, I keep them in "cruiser ready" status. The user simply picks up the gun, chambers a round, and it is ready to shoot. Cruiser ready eliminates the need to disengage the safety and action lock, which are located in a different locations on each make of shotgun. Cruiser ready status also works the same on the Remington 870. To set up a pump shotgun in "cruiser ready" status, the shotgun must first be confirmed unloaded. Open the chamber and check it. Check the magazine as well. You should see the follower, not the brass of a shotgun shell. If a round is in the magazine, empty the magazine before proceeding. Many people install high visibility followers in their shotgun magazines, and while I do not use them, I consider these followers to be a good idea. They positively confirm an empty magazine, and lower the risk of an accidental discharge. 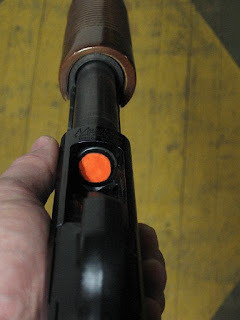 Choate's fluorescent orange polymer follower unfortunately has a stem that decreases magazine capacity. Callahan's aluminum follower is red anodized, and replaces the original follower without reducing capacity, although it is more expensive. An alternative is a bit of fluorescent orange spray paint on the original follower. If you decide to make your original follower highly visible, first remove the bluing with 320-400 grit sandpaper. Then tape the sides. Spray with your color of choice, let it dry, remove the tape and tape residue, and reinstall. Now open the chamber again, and check the chamber and magazine to confirm the gun is unloaded. Unloaded? Good. Close the chamber, point the barrel in a safe direction and pull the trigger to release the internal hammer. Once the trigger is pulled and the hammer falls, the shotgun is prepared to chamber the next round. The action lock does not need to be manipulated, nor does the safety. With the shotgun in this condition, load the magazine, and store the gun. Store the firearm in a location that does not allow easy access to unauthorized persons, but one that allows easy access if needed. When needed, the only action necessary to shoot the weapon is shucking the forend to chamber a round. I prefer to keep it so that the action release has to be depressed in order to load the chamber. That way kids or other unauthorized personnel will not readily be able to use the shotgun without permission or instruction. I had always heard that cruiser ready was having the tube loaded, chamber empty but slide cocked, so the slide release needed to be manipulated to load a shell. Supposedly this would keep unauthorized folks from being able to fire. They might get a click, but hopefully someone else would be able to take action before the action could be pumped. I also keep the shotguns configured such that one needs to hit the slide release. All my shotguns (except the SxS for quail hunting) are Mossbergs though, and the slide release is very easy to hit. Excellent advice, Xavier, and thanks for sharing this. I have been keeping several revolvers loaded around the apartment but not sure with what to do with my 2 shotguns (a Remington Youth 20 ga and a Mossy 500 in 12 ga). Now I have a better idea.